The bounty of fall, the joy of coming home after a summer away; it’s the time of year when I am overrun by the desire to cook, pickle, and can, buy way too many fruits and vegetables at the market, and usually only barely manage to rescue them, in extremis, days and sometimes weeks later, and turn them into whatever easy preserve I come across that day. Despite my determination, every year, to squirrel away a veritable pantry of homemade goods for the winter, my canning endeavors are completely haphazard. 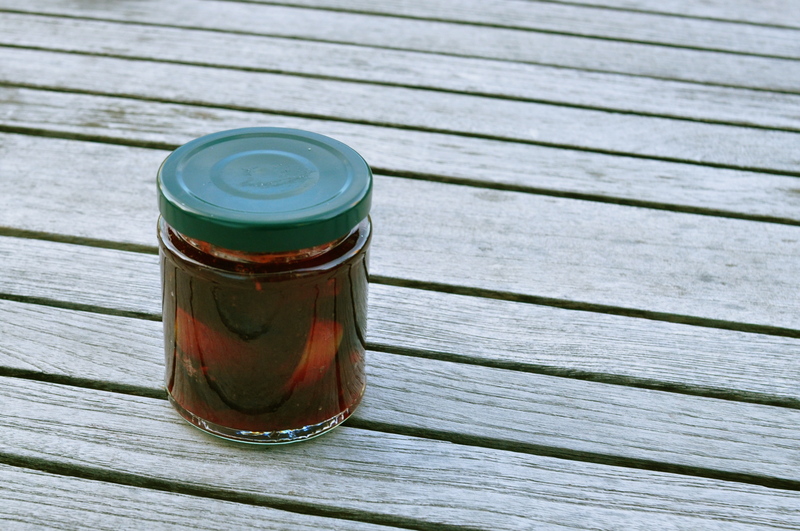 This year for example I made a few versions of this jam every time there were too many excess plums on the brink. I made a quart of tomato sauce with a few extra pounds of overripe tomatoes. I studded a cake with practically fermenting concord grapes. But one recipe I was determined to make, the instant I saw it, was Kitchen Culinaire’s peach and lavender jam. At one market on Tuesday I found peaches from upstate New York which evolved from rock hard to mealy soft without a whiff of peach in between. On Saturday I went to look for the seller of West Virgina peaches at the Mount Morris Park market that inexplicably and without a word moved blocks away to the corner of Lenox and 122nd. This producer sells hands down the best peaches I’ve ever eaten in New York, and I wish I’d known of the market’s move sooner in the season. This Saturday I went and bought many many many pounds of peaches, heaved them home, and didn’t make any jam. When, after years of peach frustration, one finally finds fruit that is all that a peach used to be, so long ago, the only thing to do is to eat it just so. Today I rushed out to buy peaches and make jam immediately; there were none, the farmer’s market replaced by a small flea. And so, even with the very best intentions, this year I didn’t manage the one jam that I had set out to do. And despite my best intentions, this post will not be about peach lavender jam. It’s about pickles. It happened by chance. I saw kirby cucumbers at the market, bought some with no plan in mind; days later when it was high time to use them, I went to this great resource for all things in jars, found this recipe, made it. It’s great. Slightly adapted from Asian-Inspired Quick Pickles by Food in Jars. One-pint Mason jars are the perfect height for these pickles. Makes 2 one-pint jars. Cut each cucumber into six spears. Cut the chili pepper in two lengthwise. Thinly slice the onion (or peel the scallions, cut then into kirby-length pieces, and slice them lengthwise) and garlic cloves. Wash the mint and coriander. 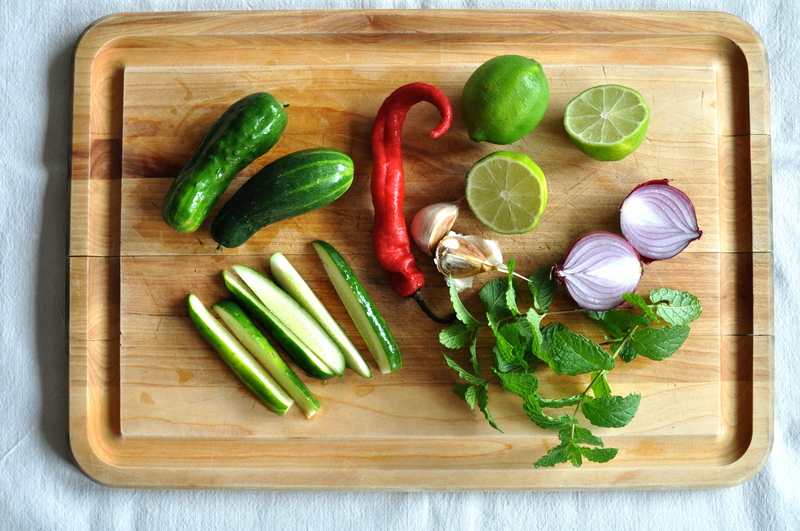 Dividing the ingredients equally between the two jars, pack the cucumber spears and slide in the chili pepper, onion (or scallions), garlic, mint and coriander. In a small bowl, stir together the rice wine vinegar, lime juice, sugar, and salt. 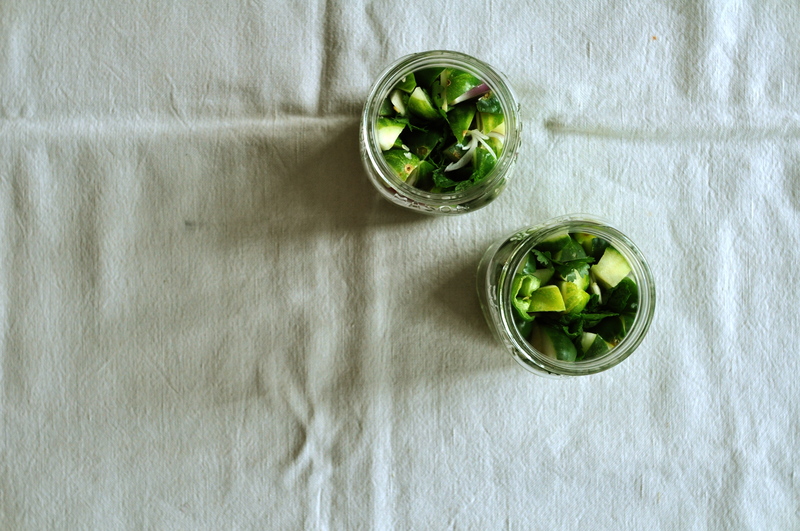 Pour the liquid over the cucumbers, close tightly, and carefully invert the jars to combine all the flavors. Let the pickles sit in the refrigerator for at least 24 hours before eating.